Suppliers would ask for sight payment where as importer want credit on the transaction. Now with buyers credit structure not available, suppliers credit is one of option for raising Libor linked finance for importer. Importer enter into contract with supplier for import. Arranger get an indicative pricing from overseas bank, which importer confirms. Overseas Bank confirms the LC and advise LC to Supplier’s Bank. 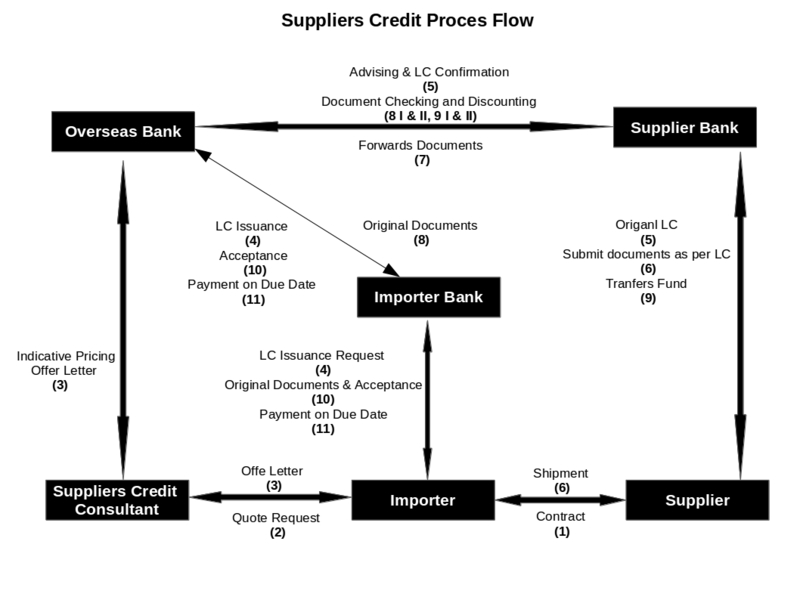 Suppliers Bank provides the copy of the LC to Supplier. Supplier’s Bank sends the documents to Overseas Bank. Incase of discrepant documents, documents are sent on acceptance basis. On receipt of Importer bank acceptance, the same is discounted and transferred to supplier’s bank. Importer’s Bank receives the documents. Importer’s bank and Importer accept documents. Importer’s Bank provides acceptance to Overaseas Bank, guaranteeing payment on due date. Arrangement has to be done before LC gets opened. Incase of LC already opened, relevant amendment has to done. Technically yes, prepayment can be made to Usance LC subject to below condition is satisfied. But as there will be loss of interest for overseas banks it will not accept reduced payment. Even if they accept it will be with penal charges. Thus practically prepayment will not be possible. Can you tell me the situation when one should opt for buyers credit and when suppliers credit. A. In large transaction case, it is better to close on financial of getting funds booked by way suppliers credit instead waiting till documents comes at banker counter and than we go out scouting for funds. This is highly relevant in the current market scenario where there is short supply of bank lines and funds. B. At time of taking sanction of term loans in capital goods, many a times client miss out getting structure of using buyers credit in first 3 years and than convert to term loan. Thus when actual transaction customer up, banker do not allow using buyers credit. Suppliers credit can help solving this issue, as normally in term loan sanction, for import of machinery, provision is Lc is kept by bank. Thus instead for going for sight Lc, one can go for long tenure LC and thus use cheaper funds which is the purpose for using either of the products. Does credit risk insurance premium form part of the All in cost? To go by RBI circular, the type of cost which are mention are related to buyers credit. Where as Credit Insurance is for different purpose and thus as per my understanding of circular, it will not form part of all in cost. Whether a client can take both suppliers and buyers credit? Customer can utilize suppliers credit and buyers credit for the same transaction subject to RBI provision for tenure, where in case of non capital goods (Raw Material, Consumables, Accessories, Spares, Components, Parts etc) total tenure should not be more than 360 days and in case of capital goods total tenure is not more than 3 years. For Example: Customer opens an LC under which he uses suppliers credit for 180 days initially and on the due day of making the payment of suppliers credit, arranges buyers credit from fresh tenure of 90 days. what are the merits and demerits of buyers credit and suppliers credit?????? What would happen if buyer promises to pay at a later date and creates a charge on the goods supplied by the seller? Would ECB and Trade credits apply. Because going by the stipulation in import of goods and services guidelines Deferred Payment includes supplier’s and buyer’s credit and are dealt under ECB + TC guidelines??? 1. ECB and Trade Credit Guidelines will become applicable in above case if deferred payment is greater than 6 Months and less than 3 years. What is difference between supplier’s credit and normal l/c discounting by beneficiary as both functions in similar way in which exporter gets fund before due date. 1. Incase of normal LC discounting exporter gets the LC discounted through his bank and interest also borne by exporter (in most of the cases). Incase of suppliers credit importer arranges to get the lc discounted through a third party bank (other than his own bank) and interest is borne by importer. 2. Incase of normal LC, exporter can also get pre-shipment funding from his working capital banker, where as in case of suppliers credit it can be post shipment funding only. Also, would this difference apply as well ? When the exporter discounts ( LC discount ) then it would be subject to the country interest rates ; and when the importer discounts ( Suppliers Credit ) would it not be subjected to LIBOR / EURIBOR rates ?? Also, a question that i had was does Euribor rates also be accounted for interest payments to the third party bank ?? 1. When importer uses suppliers credit he will get it done on Libor / Euribor rates. 2. Overseas bank quote rates at 6 Month Euribor + 60 bps. But currently, as Euribor is negative, overseas bank consider it as zero or 1 bps. What is difference b/w buyers credit and suppliers credit?? Can we make pre payment of Usance LC before due date? Yes, prepayment can be made to Usance LC subject to below condition is satisfied. What if there is a transaction between group companies and there is no LC involved ? ie the goods were imported from say the holding company and payment has been deferred beyond 6 months ? 3 Importer confirms on pricing to overseas bank and gets LC issued from his bank, restricted to overseas bank counters with other required clauses —- What are these other clauses? can you share the sample.